Warren Buffett is not tweeting inspirational quotes. But fake Warren Buffet is, and you may have seen his advice this week. An account impersonating the 87-year-old American investor shot to social media fame on Saturday when it bagged almost 300,000 likes for its debut tweet. Since then it has amassed close to two million likes for its personal, motivational, and inoffensive sound-bites. The real Warren Buffett, CEO of conglomerate Berkshire Hathaway, does have an account but he hasn't tweeted since 2016. The @WarrenBuffet99 account has telltale signs of fakery. No blue tick. Think about it. Warren Buffett is a big, big deal - why wouldn't his account be verified by Twitter? Limited activity. The account's first tweet is from 25 August and only has motivational quotes. Is this really what one of the world's richest men would focus his social media on? His name is spelt wrong. It's Warren Buffett, not Warren Buffet. These signs and warnings that the account is fake haven't stopped journalists and politicians from sharing the tweets. The account mimics Buffett's wholesome folksy style - making it feel like the man himself is broadcasting life tips in kindly tones, peppering his advice with modern-day concerns about anxiety and fast-paced lifestyles. "Saying good words to people will never go out of style," it suggests, or: "In a given day, how many hours are you happy and stress-free? Measure that." "Things I've learned with age: No happiness without gratitude; no peace without forgiveness; no good habits without self-discipline," reads one tweet posted on Tuesday. But in contrast, Buffett actually tweets infrequently and selectively. His handful of tweets include a profile of successful female business owners or an op-ed about progressive economics. Can the viral success of the fake account be attributed to our desperation for positive content in these dark times? Or maybe we're hoping to walk in the footsteps of one of the world's more successful investors. 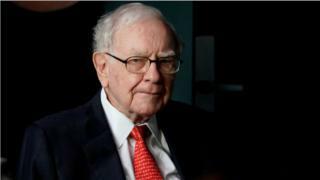 The BBC has contacted @WarrenBuffet99 to find out more behind the account but it has not responded to queries. Meanwhile if you're mourning the loss of a morning pick-me-up, fear not, you can turn to some bona fide Warren Buffett words of wisdom. "The less the prudence with which others conduct their affairs, the greater the prudence with which we must conduct our own," reads the 2017 edition of the Berkshire Hathaway annual shareholder letter.